WSU’s Master of Science in Agriculture (MSAG) program, offered entirely online, is designed for agricultural professionals, practitioners, and educators who wish to gain knowledge and skills and boost their careers. The program’s flexible, fully-online format is ideal for working professionals who want to achieve their academic and career goals with continuing with their careers. 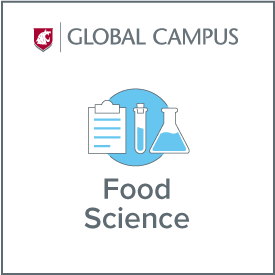 The MSAG food science and management option combines WSU’s world-renowned food-science graduate program with courses in executive management and law. The food science and management option provides students with a solid core curriculum in agricultural science focusing on valuable practical knowledge and skills for agricultural professionals. You will also take courses specializing in food science, food industry practices, business and management. This combination of science and business courses means that you will be uniquely qualified to meet the increasing demand for managers who understand science and research as well as business and industry economics. Courses range from statistics to toxicology, from organizational management to microbiology to leadership. Upon graduating, you will have a deep understanding of the scientific and technical aspects of food research, development, manufacturing and quality control. You will also have an extensive knowledge of industry standards, management practices and food law, policy and regulatory compliance. To apply for the program, you’ll need a bachelor’s degree in a related area, such as biology, chemistry, or food science with a 3.0 or better GPA. No GRE is required. Access the admission application on the WSU Graduate School Admissions webpage. Please be advised that the graduate school application deadlines may differ from those for this degree.